The Leader of the Islamic Revolution Ayatollah Seyyed Ali Khamenei says the goal behind Washington’s move to relocate ISIS terrorists to Afghanistan is to justify its military presence in the region and to provide security for the Zionist regime. 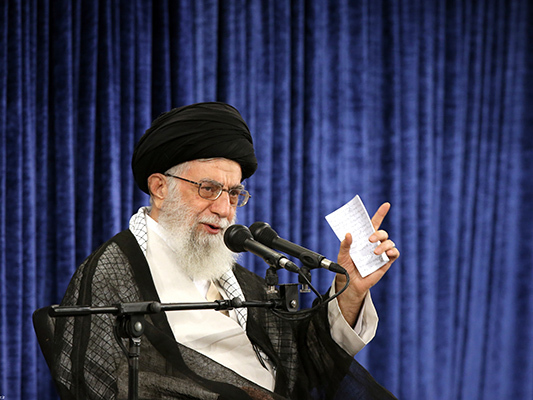 Expressing regret over the recent events in Afghanistan, which according to Ayatollah Khamenei, were perpetrated by those who claim to be Muslims, the Leader stressed they are not following Islam at all. Addressing a group of seminary students in Tehran on Tuesday, Ayatollah Khamenei also noted that those who created ISIS to turn it into a weapon for oppressing and committing crimes against the people in Syria and Iraq, after suffering defeats, are relocating ISIS to Afghanistan. “The recent massacres are, in fact, the first stage of this plot,” he added. “To the US-backed terrorists there is no difference between Shiites and Sunnis; they target civilians whether Sunnis or Shiites,” Ayatollah Khamenei said. Elsewhere in his remarks, the Leader noted that it is Washington’s first priority to keep the regional countries busy with their own matters. He further mentioned that the US does not want to see the region in peace. It wants to keep the governments and peoples of the region busy with their own stuff so as not to think of standing against the Zionists. “May God curse the [global] arrogance, its agents, and the criminal Zionist regime and the US that massacre Muslims in such a way,” highlighted the Leader.